Wash the potatoes well and boil them. Once they cool down, peel them and cut them in slices. Heat 10 g of margarine in a non-stick pan. Wash the onion and chop it in small pieces, then put it in the heated margarine along with the Schinkenspeck cut in small cubes. Once they are fried, put them in a separate container. Heat the rest of the margarine and fry the potato slices, and season them with black pepper, salt and red pepper. Add the fried onion and bacon, and stir carefully. In a different non-stick pan heat the other 20 g of margarine and fry the pieces of Fleischkäse on both sides at a moderate temperature until they get slightly brown in colour. Take them out and use the same fat to fry the eggs sunny side up. 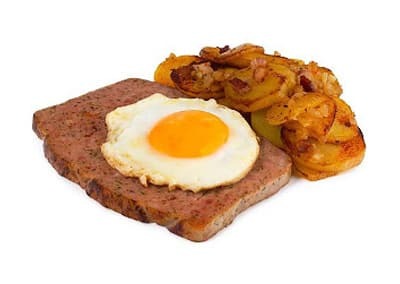 Place the egg on top of the Fleischkäse and the roast potatoes on the side.